(Newser) – President Trump said Monday that he intends to declare North Korea a state sponsor of terror. Trump called the move a long overdue step and part of the US "maximum pressure campaign" against Pyongyang, per the AP. North Korea was last on the US list of state sponsors of terror in 2008, when the country was removed in a bid to salvage a deal to halt its nuclear development. Iran, Sudan, and Syria are also designated by the US as state sponsors of terror. US officials cited the killing of North Korean leader Kim Jong Un's estranged half brother in a Malaysian airport earlier this year as an act of terrorism. 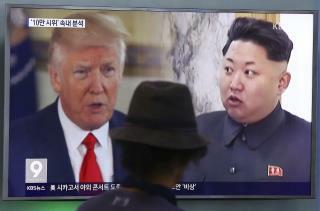 The designation had been debated for months inside the administration, with some officials at the State Department arguing that North Korea didn't meet the legal standard to be relisted as a state sponsor of terrorism. Officials said there was no debate over whether the slaying of half brother Kim Jong Nam was a terrorist act. However, lawyers said there had to be more than one incident, and there was disagreement over whether the treatment of American student Otto Warmbier, who died of injuries suffered in North Korean custody, constituted terrorism. I see the liberats are bemoaning this move because it will cripple any talks to rein in North Korea. What has been derailing the talks for the last 70 years? Some people are indeed dumber than they look but it is always apparent in how they think. I can't believe they brought up the dead criminal Warmbier again. Please, stop giving that idiot family any press.